Our students are grieving and they are mobilizing. They are ready to speak for those whose voices have been silenced. They are ready to march to the Georgia State Capitol, and in New York, and in Washington, DC. Our children are ready to lead us, to demand an end to lifeless responses in the face of another school shooting. Our students are making a statement with their feet; they are walking out of school. Standing near the staircase, looking out the windows, watching them set up 17 chairs and 17 desks in the courtyard, my breath catches in my throat and I swallow a small cry. It is a cold and windy, but impossibly sunny and beautiful, morning. I walk down the stairs and outside, together with my students and colleagues. There is a crowd gathering on the lawn. We stand in solidarity with students all over the country, who stand in support of the students and teachers at Mary Stoneman Douglas High School. Some school officials in Georgia and around the country have threatened disciplinary action against students who interrupt the school day by walking out. 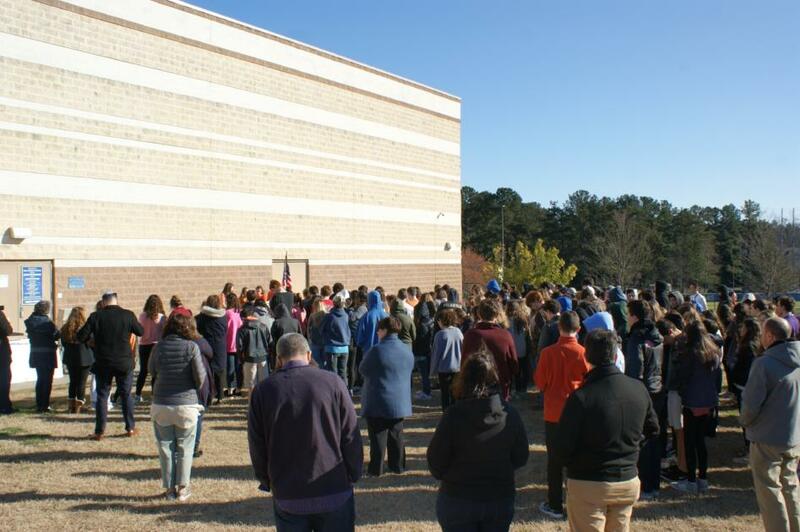 The 17-minute walkout happened to coincide with an all-school enrichment/study hall and prayer block at our school. Even if it hadn’t, we adults viewed the walkout, not as a disruption of learning, rather as our learning how to be a community. At 10:00 a.m., four students begin reading the names of the 17 people who will never return to the Mary Stoneman Douglas High School. They tell us how each of these people lived and recount how they died. They speak unwaveringly, stopping only to draw breath between the names. “Reish Lakish said in the name of Rabbi Yehuda Nesia: The world only exists because of the breath of schoolchildren.” (Babylonian Talmud Shabbat 119b) This breath is understood to mean the recitation of Torah by school children. After this recitation, three of the students share their personal connections to Parkland. The fourth asks us to join in several minutes of silence to honor the memories of the victims. We stand facing the row of empty desks and chairs. On one end, posters with messages of support are propped against the desks. On the other end, the flag sways precariously in the wind. I watch as four brokenhearted teenagers grasp hands, strengthening one another, for nearly five minutes of silence. An airplane rumbles overhead. I hear myself and those around me sniffling, crying softly, exhaling deeply. The world seems to exist only for the breath of these school children, so young to have suffered such loss. Finally, the silence is broken. We stand together for seven minutes more, as the sun warms our faces and the music fills our hearts. A guide to online courses, tools and programs for adult students.